Awesome space pictures from the Chandra Observatory. Large-scale x-ray photography by Nick Veasey. It's possible for humans to run faster than Usain Bolt, but his performance at the Beijing Olympics broke the mathematical model that has fit sprinters for 100 years. Researchers using Google Earth have determined that cows tend to align their bodies with the North-South axis of the earth. No one is sure why. 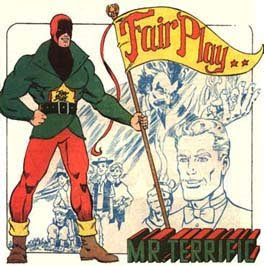 An Indian film company is being sued by Warner Brothers for its production of a movie entitled Hari Putar. Recent research sheds light on what it takes to increase the lifespan of your body's cells. Continue reading "Tuesday morning links - 8/26/08"! This article from the Boston Globe on opening up science* pointed me to some really exciting online resources that are free and open for anyone to access. Most interesting is the Journal of Visualized Experiments (JOVE). This site publishes videos of experimental protocols submitted by researchers. Each is reviewed by a panel of experts, so quality and relevance are ensured. The videos range from basic wet-lab techniques and equipment-care tips to highly specialized imaging and brain recording methods. It's all free and open from the start, you don't even need an account. This is extremely useful for other scientists, particularly those attempting to learn a technique for the first time. It's also a great example of transparency and camaraderie within the scientific community - a group that unfortunately, faced with trickling grant money and declining job prospects, are often forced to be quite competitive and opportunistic. I see sites like this, however, as really important for educational purposes, for getting the word out on what scientists do day to day. Videos are especially useful for this because they get around technical learning curves that prevent most from comprehending scientific journal articles. You don't need to have an extensive background knowledge to understand what a scientist did in the methods section of a scholarly paper if you can see it. Ever wanted to know how scientists image individual neurons within a living brain? How stem cells are collected and analyzed? Now you have videos with pretty pictures to watch. Any effort to remove some of the secrecy and mystery associated with research, to help the public see that science isn't just for stuffy Ph.Ds and nerds, but rather, can be an interactive, dynamic, and open exchange of ideas among researchers and everyday people, is worthwhile and necessary for progress. *I plan to comment more about the open science movement. The linked article discusses some of the reservations old guard scientists and journal publishers have about giving everyone access to their data (so read that too), along with several web 2.0-esque science resources new to the internet. I think it's an interesting generational issue, sort of the Napster debate of science. Busy day, so here is something fluffy to distract me (and you, potentially). I came across this food meme earlier. Are you an experienced eater? The foods I've eaten are below, bolded. 2. Nettle tea - No, but I've seen Survivorman make it. 6. Black pudding - Somehow I missed this one in London. 17. Black truffle - But never enough to really appreciate, that stuff is expensive! 18. Fruit wine made from something other than grapes - I think I've had some terrible rasberry wine. 25. Brawn, or head cheese - This isn't actually the brain, I think people think it's the brain. 41. Curried goat - Many other curries, but no goat. 42. Whole insects - Ants, as a kid. 46. Fugu - No, but I dare my brother to try it when he moves to Japan. 55. McDonald's Big Mac Meal - Again, unfortunately. 62. Sweetbreads - Mmm, thymus glands. 74. Gjetost, or brunost - Tried to find it once, but failed. That's 66/110, 60%. Not bad, I've had variations on some of the non-bolded items (such as steamed lobster, sans thermidor treatment), and some are prohibitively expensive for a poor twenty-something student. Continue reading "Tuesday morning links - 8/19/08"! In case you hadn't heard, the Olympics are in full swing. I can't seem to turn the television on without seeing Bob Costas's rigorously-coifed head. My recent post on cloning has gotten me thinking generally about bioethics, a topic with clear relevance to sporting events. Last week's issue of Nature has an editorial about drug testing and the anti-doping industry. It's interesting, because they point out that like the War on Drugs, which many argue in some cases has increased drug trafficking via clever, motivated smugglers, the rise of drug testing in sports in the 1960s has stimulated an arms race between those regulating and those that attempt to cheat. The authors call for a reevaluation of the anti-doping strategy because it doesn't prevent cheating, only necessitates more sophisticated cheating techniques. When a world-famous athlete like Marion Jones can appear to win several gold medals fairly, only to have them revoked years later upon confession of cheating, there's a problem. John Tierney at the NYT discusses a mostly serious argument for eliminating anti-doping laws altogether, in a sense opening up sports to a free market of performance enhancement. With the prospect of "gene doping," which involves inserting theoretically untraceable strength-enhancing genes into an athlete's DNA, and other sophisticated techniques, it's clear that more people will be able to cheat undetected in the future. The point is, the legitimacy of sports hinges on the assumption that everyone is playing fair. The reality is that what the public may view as fun and games, the coaches, team owners, company affiliates, and even athletes see as business (Example: China has spent ~46 billion on the Olympics), and are prepared to do whatever is good for business. Wins equal media attention, advertising dollars, national/political pride, etc - valuable commodities that have nothing to do with the purity or *fun* of the game. It's interesting to think what sports would be like if the competitors were allowed to do whatever possible to win. I'm not much into sports now, probably for a lot of cynical reasons, but I think I could get into a game featuring genetically modified athletes. Who knows, maybe in twenty years we'll be watching the 1st Mutant Olympics. Check out this cool internet meme timeline. It's interactive! Zoom down to the month scale to see them all. After the jump. This makes me nostalgic for those *simpler* days when I had to sign into AOL with my 56.6K dial-up modem to see the internet. My family was a little late to adopt internet usage, our first serious computer purchase was around 1996, if memory serves. I definitely remember the Dancing Baby meme, though that memory might be from something similar in an episode of Ally McBeal. Notable high school memes included the Blair Witch Project, Hamsterdance, Homestar Runner, and (unfortunately) Bonsai Kitten. From college, the Ashlee Simpson lip-sync snafu, Chuck Norris facts, Ask a Ninja, I Can Has Cheezburger, and (again, unfortunately) OK Go memes stand out in my mind. I feel both young and old. South Korean researchers at Seoul National University and RNL Bio have produced the first commercial dog clones, a litter of five pitbull puppies. The customer is a Californian woman who lost her dog Booger two years ago. Skin cells from Booger's ear were used to produce the cloned embryos, which were then gestated in surrogate dogs. Pet cloning is prohibitively expensive, upwards of 50-100K per animal, so the market for this is small. Top police dogs and other valuable animals are being reproduced around the world for noncommercial applications. RNL Bio isn't wasting any time getting the word out about this new business. CEO Ra Jeong-Chan was quoted saying they would produce 300 dogs for wealthy owners over the next year and "will consider cloning camels for rich people in the Middle East." Seoul National University, in collaboration with RNL Bio, a biotech firm, has been responsible for many recent cloning advancements and scandals. SNU cloned the first dog, an Afghan hound, in 2005. It was also at SNU that Hwang Woo-Suk famously fabricated data in papers claiming the cloning of human embryonic stem cells. Of course, this will spark renewed debate over the ethics of cloning. Humane societies have already come out in opposition of RNL Bio's actions, claiming that the money for cloning new animals would be better used to save thousands of sick and stray animals, animals that are already alive. The cloning process is still rather crude, they point out, requiring many attempts to get successful implantation, which requires many surrogate animals. Human cloning is even more complicated, and many see these continued animal-research successes as a slippery slope that ends with replicated humans, genetic engineering, and eugenics. After Dolly, in the mid-1990's, there was a firestorm of political debate on the issue. It even trickled into popular culture (see GATTACA and The 6th Day for one good and one horrible movie take on cloning, eugenics, etc). A lot of the controversy over cloning is focused on research that doesn't actually involve full-formed clones, but rather stems cells, gene manipulations, and the production of chimeras for medical benefit. This sort of tinkering with nature scares people. I think many understandably have a gut "ick" reaction to the possibility of human cloning and related research. There are few issues with more moral and ethical ambiguity. Cloning brings to question all sorts of philosophical quandaries - personhood, continuity, existence - and forces people to think about what makes them who they are, which is a difficult introspective task. Is a person meaningfully described by their DNA? How much of you do you need to still be you? How much of you is a product of your environment? It's not an easy issue for people to deal with, and it never will be, but the public's apprehensiveness to cloning research is primarily based on fear of its misuse. People will always fear abuse of scientific knowledge (often justifiably, just look to the Manhattan Project's spoils, or bioterrorism) but the mere potential that one day someone will exploit cloning at the pain of others does not preclude need for the fundamental research, the potential benefits to society are too great. 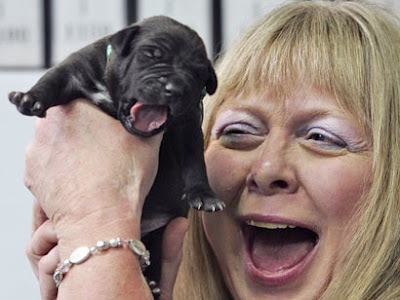 Continue reading "Cute Science: Commercial dog cloning"! Jason Bond, a biologist who recently named a spider species after Neil Young, has named a new spider after Steven Colbert. This adds to the list of things already bearing Colbert's name, including a bald eagle from the San Francisco Zoo. Colbert reacts, talks to Bond in the hilarious video clip below. Here's another awesome trapdoor spider video. In a small attempt to make this page a little easier to read, if not a little more structurally sophisticated, I've added a Blogger hack that limits the amount of a post that show up on the main page. Now, if you come directly to the main page, and not from an RSS reader, you will see truncated posts. This cleans up the main page and it should load faster (I don't really know if page loading is an issue for anyone anymore). Also, this allows me to use blogspeak such as "below the fold" and "after the jump." Someone on the Blogger discussion forums directed me to this site. It has tons of helpful tips for blogging on Blogger, particularly for those who don't know anything but the simplest HTML, CSS, etc. I've also added a widget at the bottom of each post that shows links to posts with the same labels. I tag a little too liberally though, these lists might get long. It's pretty well known that yawning is contagious. 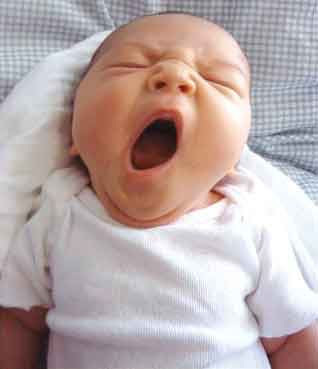 If you see someone yawn, you are more likely to yawn. This phenomena is poorly understood, but it's thought to have developed as a result of increased primate nonverbal communication - signaling boredom or tiredness. It also may underly empathy; autistic children, who exhibit blunted social awareness and empathy, do not experience contagious yawning. 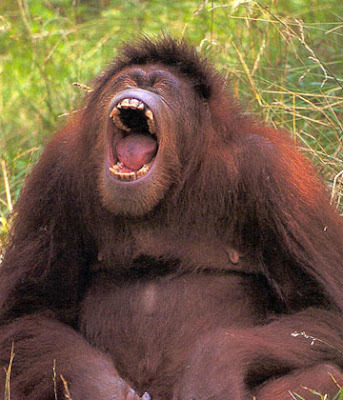 Humans "catch" yawns from one another, from chimps and other primates, and vice versa. 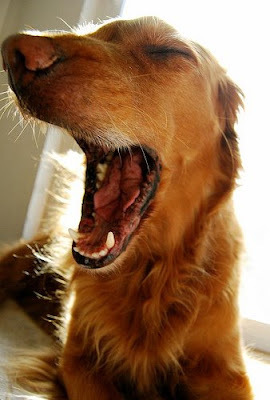 A recent study suggests that dogs can catch yawns from humans. This blog post covers the paper in more depth. This article has a video of the experiment. It's unclear whether dogs can catch yawns from other dogs, or only from humans. If only from humans, it suggests that the ability stems from thousands of years of selective breeding for dogs that were better able to read subtle cues in the countenance of their owners. 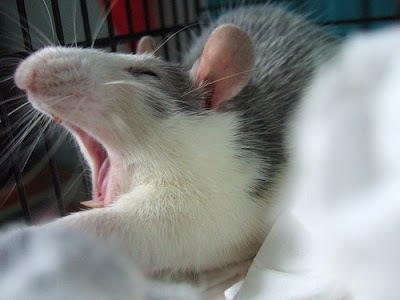 Continue reading "Yawns are contagious"! 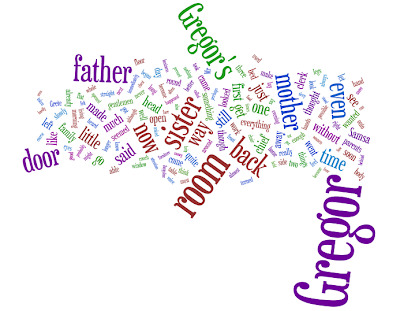 I just discovered Wordle, a Java applet that creates word clouds out of text. The frequency with which a given word appears is represented by its size in the cloud, so you can look for patterns or themes in a block of text that might not be obvious when presented in a normal format. You can create your own at the site, adding text or links to a webpage or del.ici.ous site tags. The clouds can be customized by font, layout, color, etc. Once you've made your cloud, you can save it to the site's gallery, which now has over 100,000 additions. The Worldle Blog, written by the applet's creator, Jonathan Feinberg of IBM, offers a discussion. I've made a few clouds, shown below the fold. Not sure if they are particularly interesting, but these texts came to mind. 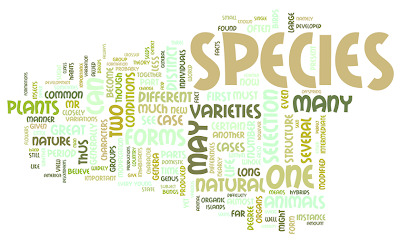 Continue reading "Wordle me this..."! According to this article from the BBC, the flat-earth community is alive and well these days in the 21st century. It's the 50th anniversary of the founding of NASA, an event that has sparked renewed interest in conspiracy theories about faked moon landings and fake, spherical pictures of the earth taken from space. One notable organization is the Flat Earth Society, whose motto "Deprogramming the masses since 1547" is almost too funny for words. (Check out their site for a good laugh/cry). The flat earthers, as a group, deny that our planet is a sphere - that's clear and simple. The specific shape of the earth, however, is still a topic of debate. Some think the earth is a disc with infinite horizontal distance. Others think it a disc with a fixed diameter, like a giant coin. Most interestingly, the article points out that flat-earth conspiracies were not pervasive during the Dark Ages, as is the common understanding, and only received widespread attention in the 19th century, as Christian authorities sought to counter the progression of scientific rationalism. Faced with the popularizing of naturalistic accounts of earth history, Christian "thinkers" toured the country spouting alternative accounts of the organization our planet and solar system. This is a perfect example of misguided skepticism. Instead of questioning complex, fantastic explanations for phenomena, replacing them with parsimonious, evidence-based answers, the flat earthers simply deny the evidence - claiming it's widespread propaganda from the Authority - and insert an alternative explanation. Skepticism is vital for scientific progress and critical, rational thinking in everyday life. Question everything, sure, but allow yourself to adjust that skepticism according to the evidence presented to you. Continue reading "Flat Earth? F**king Moron"! The Drunkard's Walk: How Randomness Rules Our Lives by Leonard Mlodinow. Mlodinow is a Caltech physicist and author of several popular science books, notably, Feynman's Rainbow and (with Steven Hawking) A Briefer History of Time. This new book explores probability in everyday life, emphasizing how humans misunderstand randomness. We (read: primates) are especially evolved to form patterns and associations, to build heuristics that confer us some ability to predict future events. In other words, we seek out non-randomness in the world, a quality that was helpful in a simpler time, before modern civilization, but one that can lead to bad probability judgments when applied to modern scenarios. I've only gotten a few chapters into this, but so far it's highly entertaining and informative. Pastoralia by George Saunders, is a collections of short stories and a novella. As the book jacket notes, Saunders is an author in the tradition of Mark Twain, Thomas Pynchon, and Kurt Vonnegut, sharply satirical and smart. The title story, "Pastoralia" is a swift and punchy, but utterly disturbing riff on the absurdity of modern America. After reading this, I'm going back to get all of his other work. SEED Magazine has been around for a couple years, along with its blog network Scienceblogs (Something else I would recommend as a great place to read about science/politics/culture/etc). I've been a subscriber and reader online for a good chunk of that time. Their motto, "Science is Culture," reflects the focus on the confluence of science and society, what really interests me about the magazine. Great art design too. The Naked Scientists is a podcast by several young Cambridge, England researchers, distributed by the BBC. 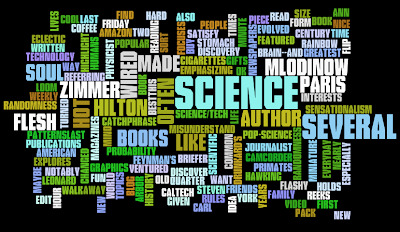 It covers a wide swath of popular science stories, from public health to space exploration. Each episode includes a review of the week's science news, Q&A with listener email, interviews with prominent researchers, and a "kitchen science" experiment reminiscent of Mr. Wizard. Add in a bit of cheeky Brit humor, and you've got a great show. What makes it really entertaining, in my opinion, is the hosts' enthusiasm for the subject matter and interest in promoting public scientific literacy. The science is presented in an accessible way, but it's never dumbed down. Philosophy Bites is a great little podcast by two British authors. Each week they interview a philosopher on a specific topic - such as, for example, evil, forgiveness, infinity, and human rights. This week's episode discusses the paradox of tragedy - that is, how we seemingly take pleasure from tragic literature and film, even though such things are filled with pain and suffering. Most of these discussions are 10-30 minute segments, so it's easy to stay engaged. Continue reading "For Your Consideration: Media recommendations"!